When recalling the stupendous San Francisco teams of the 1980s, the West Coast offense designed by Bill Walsh and orchestrated by Joe Montana, Jerry Rice and Dwight Clark usually dominate the conversation. Discounting the running game short changes the contributions of the ball carriers. Coach Walsh’s game plan often passed to open a lead, and in the fourth quarter, pounded the pigskin to kill the clock. 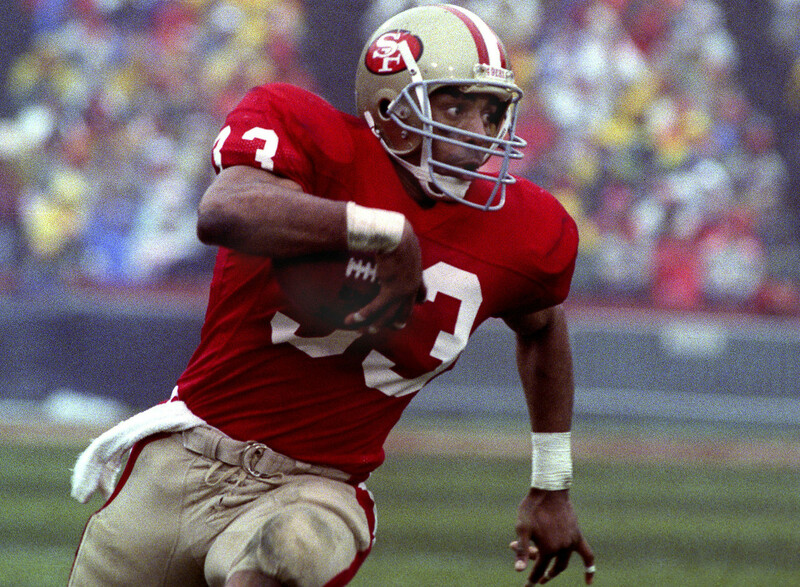 In his third year, Roger Craig become the first player in NFL history to eclipse 1,000 yards rushing and receiving in the same season: He averaged 4.9 yards per carry and 11.0 yards per reception while scoring 15 times. Craig also led the NFL in receptions with 92. In 1988, Craig captured the AP NFL Offensive Player of the Year, helping the 49ers to a victory in Super Bowl XXIII over the Bengals. He led the league in yards from scrimmage with 2,036 and set a personal high with 1,502 yards rushing. A unique running style, the dynamic dual-threat challenged tacklers running with his eyes wide open and knees high: It took courage to bring down the former Cornhusker. Craig caught an astonishing 566 passes for 4,911 yards and totaled over 13,000 yards from scrimmage during his career. Any conversation in regard to the West Coast offense must include the Hall of Famer. In the Nineties, the Spin Doctors produced two top 20 Billboard Hot 100 hits. During the Seventies, Chuck Foreman was the original Spin Doctor in Minnesota. Foreman frustrated tacklers with spectacular spin moves in the open field, gained tough yards between the tackles and soared into the end zone. With sure hands, quick feet and precise route running, he was occasionally employed out wide, challenging defenses on all three downs. In 1973, the Vikings drafted the University of Miami star with the 12th pick overall, and Minnesota reached the Super Bowl in three of his first four seasons in the league, losing against Miami, Pittsburgh and Oakland. He exceeded 1,000 yards rushing three consecutive seasons: 1975-1977. Over his career, Foreman snatched 350 passes, and in ‘75, led the league with 73 catches. Only O.J. Simpson eclipsed the versatile Vikings’ 1,761 yards from scrimmage and 22 touchdowns in the memorable crusade (1975) when Foreman was named to the First Team All Pro. He twice led the NFL in touchdowns (’74 & ’76) and earned five trips to the Pro Bowl. The All-Purpose playmaker suited up in thirteen post-season games but never earned a ring. When his career ended, Foreman had produced 9,106 yards from scrimmage and scored 76 times. Hopefully, the nine-man Seniors Committee gives the original Spin Doctor an invite to the Hall of Fame in the future. During thirty years of managing fantasy football teams, the outcomes of trades have varied, and at times, did not benefit my team as much as expected. However, when I acquired RB Ahman Green in a keeper league in 2000, lady luck unexpectedly came along in the deal. Green soared to fantasy glory and steered my club to back-to-back championship games. The Seattle Seahawks selected the former Nebraska runner in the third round of the 1998 Draft, and he languished on the bench for two seasons. The Packers surrendered defensive back Fred Vinson and a sixth-round pick to acquire Green, who blossomed in Green Bay, and a fifth-round selection. In six of the next seven campaigns, he rushed for more than 1,000 yards, and totaled over 1,400 yards from scrimmage. In 2003, the Packer playmaker produced a crusade that is often overlooked. He finished second in the NFL in rushing yards—behind Jamal Lewis who terrorized opponents for 2,066 yards—and second in touchdowns behind Priest Holmes. At 6-foot-0 and 217 pounds, Green perfectly complimented Brett Favre and the passing attack. One of the great screen runners in history, Green latched onto 378 passes for nearly 3,000 yards with 14 touchdowns during his career. He concluded his tenure in Title Town as the teams’ all-time leading rusher (8,322) and earned four trips to the Pro Bowl. The powerful Packer changed the fortunes of alternative-reality zealots, and the Green Bay franchise at the turn of the Century. While the franchise is often remembered for its all-time great quarterbacks (Johnny Unitas and Peyton Manning), Colts’ uniforms have decorated a plethora of runners who carved out memorable careers. Lenny Moore, the ninth overall pick in the ‘56 draft, immediately impacted the league and was named Offensive Rookie of the Year. In 1958 and 1959, Baltimore captured consecutive NFL Championships, beating the Giants twice. In the two championship games, Moore recorded nine receptions for 227 yards and a touchdown. In 1958, he averaged 7.3 yards per carry, finished second in yards from scrimmage (1,536), third in all-purpose yards (1,638) and second in touchdowns. Moore predominately played flanker early in his career and moved to the backfield full time in 1962. He netted the 1964 MVP when he established a league record with 20 touchdowns, and earned consensus First Team All Pro honors four times. When the curtain closed on his career, the fleet-footed star accumulated 11,213 yards from scrimmage, snatched 363 passes and scored 111 times. At 6-foot-1 and 191 pounds, the Hall of Famer might be a better player in today’s game than he was in the Fifties. Emmitt Smith and Barry Sanders established many rushing records, received the accolades from the media and earned the admiration of fans in the 1990s. While Ricky Waters went overlooked by casual followers, fantasy owners loved the pass-catching dynamo. Two signature plays illustrate Waters’ controversial career: In Super Bowl XXIX, the 49ers’ game breaker ran a beautiful pass pattern down the seam of the Chargers’ defense and scored on an amazing over-the-shoulder 51-yard scoring strike from Steve Young; the next year, as a member of the Eagles, Waters short-armed a pass from Randall Cunningham during the first game of the season and stated “For who? For what?” afterwards, which did not adhere him to the Philly faithful or NFL fans across the nation. Nevertheless, astute fantasy owners always welcomed the former Notre Dame product on their rosters. From 1992-1996, Waters earned five invitations to the Pro Bowl and rushed for over 1,000 yards for three different franchises: San Francisco, Philadelphia and Seattle. 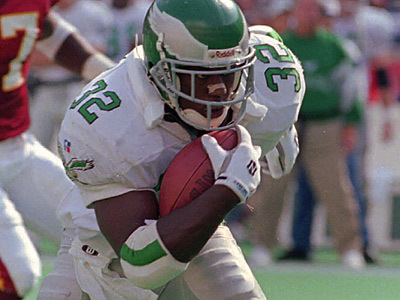 Without question, he soared highest as an Eagle in 1996, leading the league in carries with 355 and yards from scrimmage with 1,855. Two post-season games underline Waters’ incredible ability: In 1993, he scored five touchdowns against the Giants in the Divisional Round of the Playoffs and three times versus the Chargers in Super Bowl XXIX. An emotional player, he played with passion and many people did not like his outspoken and braggadocious personality. Despite a stunning resume, Waters awaits a Hall of Fame call after totaling 14,891 yards from scrimmage and scoring 91 touchdowns. I was a freshman in high school when Herschel Walker adorned the cover of Sports Illustrated and ascended to national prominence. My English teacher caught me reading the article on the Georgia sensation during class and asked me to put it down, which I finished on the bus ride home. In 1982, Walker captured the Heisman Trophy, and afterwards, left college early to join the USFL, signing with the New Jersey Generals. I became a loyal cadet of the team, and in ‘84 and ‘85, I travelled south from Connecticut to New Jersey to watch the Generals play at least twelve times. Cheering for the 6-foot-1, 225-pound game breaker became an obsession and attending games are some of my fondest memories. In 1985, Walker set a professional record for rushing yards (2,411), scored 22 times, totaled 45% of the team's yards from scrimmage and led the Generals to an 11-7 record. On April 7, 1985, Hall of Fame quarterback Jim Kelly and the Houston Gamblers visited the Meadowlands, and I sat on the 40-yard line to witness Walker’s incredible afternoon: He rushed for 233 yards and scored two touchdowns, including a league-record 88-yard scamper in the first quarter. 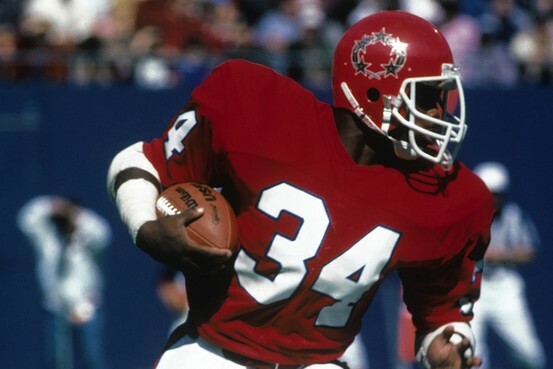 The USFL folded after the 1985 campaign, and Walker joined the Dallas Cowboys in 1986. The College Football Hall of Famer’s forgotten season dwells deep in my memory bank.